1. Every year of life, and the good friends that go with it..
Last week I celebrated my birthday. Again. Every year, another one. Last year was a very significant one but this year, I have announced to everyone that I have made a turnaround, a u-turn - and instead of the numbers increasing, they are decreasing. So this was my 49th birthday. Again. :-) It was nice to have a few of my dear friends over for supper and the evening. Corinne, Claudia, Viorica and of course, Corinne's best friend, Silutsu(Silas) all helped me to enjoy a quiet but very pleasant evening. This was possibly the last time I will entertain in this apartment as I will be moving out just before I head to Canada. Not sure where I will live when I come back at the end of February, but I know that the Lord has just the right place for me. 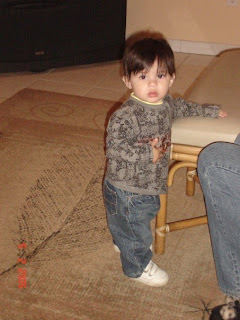 Speaking of birthdays, last month my wonderful grandson Alejandro celebrated his 1st birthday! Take a look at these photos and see how much he has grown in the space of a year! So, for a couple more weeks I will enjoy life here in Moldova as the weather is getting colder and colder. Several of my teammates live in the villages and making the long trip to the little house in the backyard in the bitter cold is not something I would want to do every day. But they are willing to live simply and to recognize that the comforts of modern life and suburban 'success' are nothing compared to the joy of sharing the love of God and the hope of Jesus Christ with people whose lives are hard and whose hope is lost. All of us missionaries are not living as simply as those in the villages, but whether our lifestyle is easy or hard the most important thing is what we value. We seek to value what Jesus valued. Jesus valued His relationship with His Father above all. His life was a walking demonstration of the love of the Father for all people and His death was a sacrifice that made it possible for all of us, for each of us, to have an intimate relationship with the Father who forgives those who trust in His Son. Posted by Barb at 11:47 a.m.